Crusting of the eye lashes when awakening from sleep. These symptoms are caused by an infection of the conjunctiva of the eye. The conjunctiva is a thin membrane that covers the white area of the eye or sclera. During a pink eye infection this conjunctiva becomes infected and inflamed causing the symptoms and eye drainage. During sleep this eye drainage clumps around the eye lashes making opening the eye in the morning almost impossible without first cleaning the lashes. During times when it is caused by allergies or a chemical substance the irritation is more common in both eyes and the discharge from the eye is usually clear and watery. This condition is easily spread from person to person by touching an infected person’s hand after they have touched the infected eye, sharing towels, makeup or through coughing/sneezing if a person with a cold is present. This pink eye or conjunctivitis can be caused by either bacteria or viruses. The infection most commonly starts in one eye but can easily be spread to the other eye by the infected person themselves. 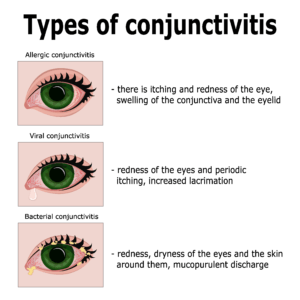 Infrequently conjunctivitis can be seen in children with Kawasaki’s disease, Crohn’s disease and ulcerative colitis. If the pink eye is caused by a viral infection antibiotics will not be effective against the germs. In this case the treatment often consists of antihistamines to keep the eyes dry and help the itching and anti inflammatory medications to help the swelling in the eye. 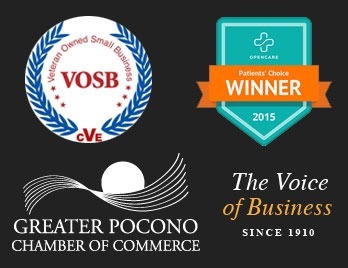 Patients often find that cold compresses are helpful to ease the discomfort.